As you’ll see, the summary instantly changes as you adjust the settings. Once you are satisfied with the summary, you can copy it, or save it, or discard it. 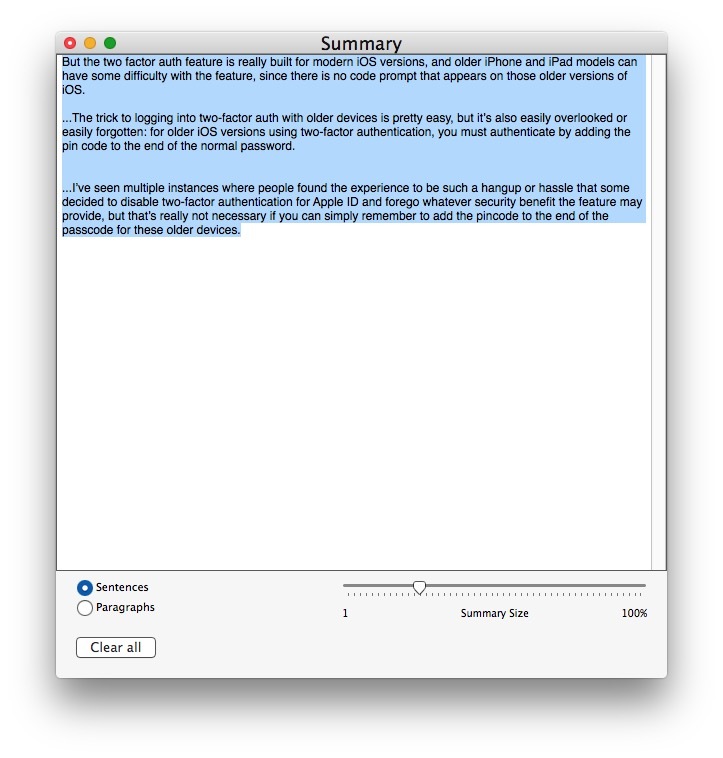 You can pick paragraphs or sentences, and adjust the length of the summary, which can vary from a simple outline condensed from the document, to a nearly cliff-notes like version of the text in question, or anything in between. 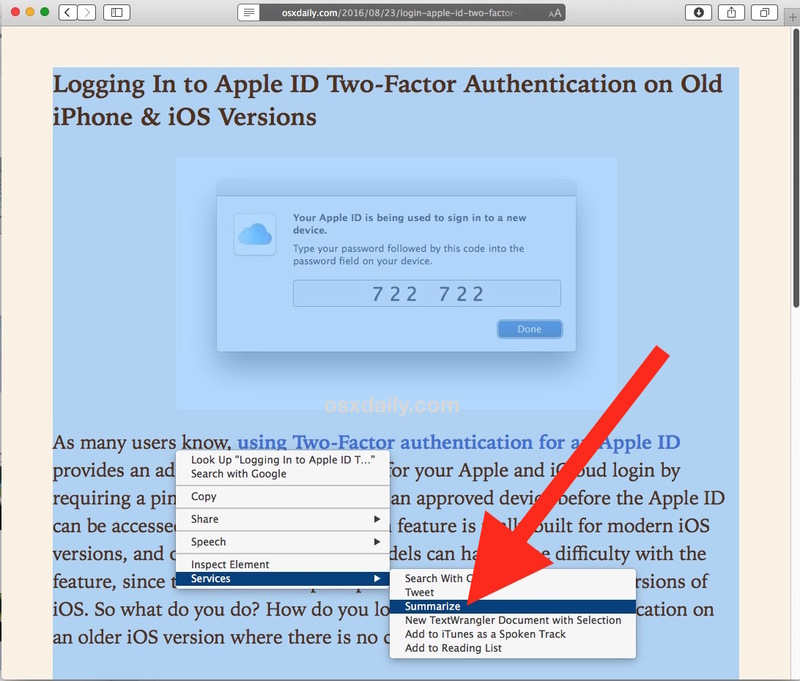 Summarize must be enabled on most Macs before it will be usable, and then its just a matter of learning how to use the summarize feature to provide a condensed overview of the document, web page, or any selected text. You can use the little adjuster dial at the bottom to shorten or lengthen the summary, you could really squeeze down the word count if you wanted. It does a decent job but it’s not perfect. Instead of “Right-click on the selected text and go to the “Services” menu”, I had to click on “Word” – next to the File menu at the top of the screen – and then go to the Services menu. Thanks, it worked as it’s supposed to. It would be more helpful to me, if I can find a way to increase the type size. Anyone know of a way to do that? Even if I increase the size of the dialogue box, the type size stays the same — about a six-point “mice” type. Looking under Summary Services preferences, that only took me back to the Keyboard Shortcuts. Would love to hear any suggestions. Thanks. Not sure about Summary Service but you can easily copy it into TextEdit and increase the size there. I’m sure there’s a better solution. This will really increase the size of the type, but maybe you can make this work. 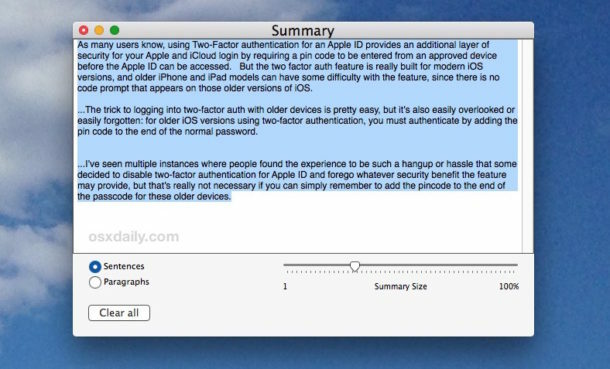 I was hoping for something like this but alas, it doesn’t seem to work in 10.7.5 (Lion) after the right click is applied to the selected text, there is no “services” in the following submenu. I didn’t see an OS limitation in the article. Opened the document in Pages. Saved it and made sure the .doc suffix was added. I then opened it in Word and it was a shorter document that I could change as I wished. Is there a way to do it with text on a web page? Yes. Method one is to select the text on the page manually and then use the summary function. But if you first open “Reader View”, then Command A (select all) then it works quite neatly. You can try it on this very page. Just hit command + and you type is increased in size. Command – to reduce it back to the regular size. Love this forgotten feature. 40% seems to be the sweet spot. Btw, when was this added to the OS? Can’t get it to work in El Capitan. What am I doing wrong? I’m running El Capitan. That feature isn’t available in System Preferences. 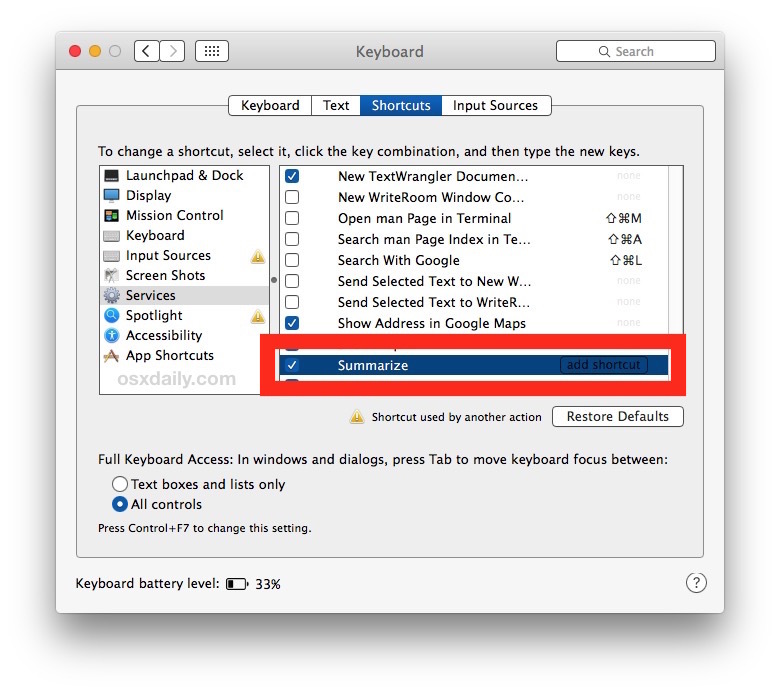 Summarize is a feature in Mac OS X, saying it isn’t there is like saying “Finder” isn’t available. What that means is you are having an issue specific to you or you are not looking in the right place. It is unequivocally there, I have El Capitan and Sierra and it is there in all.